Ever heard of the “affect heuristic”? Short version: How we feel is how we think. Positive feelings lead to higher motivation and willingness to try new things. I’ve never been a doodler but I sketch frequently in class to aid comprehension. The kids laugh at my silly drawings but also learn from them. I began to wonder: How could I build on that joy? I decided to learn more about visual notetaking (also known as graphic visualization or sketchnoting) and began practicing at home. Yes, practicing. Building my own “visual library” has been oh-so-helpful—a creative activity that keeps me thinking about the best ideas to represent in the curriculum. During our plant unit, student-directed drawings of important concepts served as a helpful reference that we built upon each day. Sure, I could sketch concepts in advance. It would be expedient—and more polished. But instead, I started drawing in class more frequently: sketchnoting while we were reading complex ideas and sequences out loud, while we were learning vocabulary. I even built these “visual moments” into bigger sketches in front of the kids. Near-instant synthesis! The kids were gloriously engaged and interested. There was just one problem: I was learning more than my students. Thinking in metaphors. Viewing content through a new lens. My retrieval and consolidation of information were improving, the connections easier to create. Here was neuroplasticity in its finest form—my brain was learning new skills quickly, rewiring neural connections as I changed my habits of thought. A sketch in progress as my 3rd grade ELL students learned about North Carolina’s native peoples. While reading together, stop at predetermined places and briefly discuss how you could visualize that part of the story or passage. Yes, it’s merely a simple twist on “what just happened?”—a time to gauge comprehension. But it’s also an opportunity to incorporate discussion etiquette, build on others’ ideas, and draw conclusions (pun intended). Begin with simple sketches kids “direct.” You draw, but elicit input from your students. Talk about the best way to encapsulate an event, a feeling, or other point of focus. Let your students see you make mistakes or draw imperfectly. This gives them permission to do the same. Conjuring up visual metaphors is not easy; it requires us to tap deeper into our imaginations and link ideas together into larger patterns. Constructing the “big picture” interactively, in the moment, is challenging. It’s always exciting to have a real author visit our school! Later, reviewing the event, visual notes sparked memories. Some students will be ready to sketch independently, so offer opportunities to do so after the group discussion. A one-minute time limit discourages perfection while encouraging an immediate and reflexive response. It’s crucial to let students know that craft matters far less than concept here. Emphasize the essence of the sketch over artistic detail and, if you add an oral component, focus on the act of summarizing over perfect grammar. Invite those who are struggling to copy your sketches. The act of copying may not be creative but it allows students the benefits of processing time and helps them gain confidence. Limit drawing space. Depending on the number of stop-and-draw points I’ve planned for a class, I sometimes ask students to fold their papers into four, six, or eight squares. The limited space is far less daunting than a full sheet of blank whiteness—and keeps our lessons on track. Ask students to explain. Extend and cement students’ learning by asking them to write brief sentences about their visual notetaking and to share out loud with a partner or the group. Use graphic visualization as a strategy for mindful engagement. Reel students in for one-minute thinking rallies, as a scaffolding tool for muddling through tough ideas and as a transition or change of pace. Learn from what they produce. My students surprised me, conjuring images as if they’d always done it. For many, visual assignments were their “way in” to the content. Listening to their discussions of details demonstrated their critical-thinking skills were more advanced than I’d realized—and I could better help them transfer these skills into writing and verbal communication. ELLs summarized major sections of The One and Only Ivan by Katherine Applegate in visuals and sentences. Holism. It exercises students’ kinesthetic, auditory, linguistic, and verbal modalities. Feedback. Visuals offer tangible, immediate insight that teachers can use to gauge and build upon comprehension. Chemical changes. It can generate a much-needed dopamine surge for pleasure, oxytocin surge due to love and trust that undergirds success, and a decrease in cortisol associated with stress. Connectivity. Ideas filtered through visual notes leap off the page and nourish the brain’s love for connections, imagery, and storytelling. Fun. Big-picture comprehension. Deep thinking and imagining. Synthesizing information. Cerebral satisfaction. A “brain break.” A chance to revisit content. Listening. Laughing. 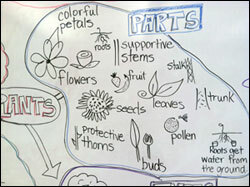 Visual notetaking wraps up all kinds of critical thinking, synthesizing, and problem-solving goodness! What are you waiting for? Start drawing! Wendi Pillars is a National Board-certified teacher in English-language learning and a member of the CTQ Collaboratory. She has 16 years of teaching experience, both overseas and stateside. Join her on Twitter @wendi322.